This beautiful side dish is as fragrant as it is deliciously mindful. I hope you enjoy it enough to make it a regular part of your meal plans. Leeks are related to onions and garlic. The taste is similar to an onion but far more subtle. If you do not care for onions, you may very well love a leek! The dish works well with olive oil instead of butter. If you do not cook with wine, substitute vegetable stock with 1 teaspoon of cider vinegar. Choose leeks with long white and light green sections. Because of the way leeks grow, you will need to clean them well in order to avoid eating dirt. Rinse the leeks to remove external dirt. Slice off the roots. Look at the remaining leek. The top is a lovely dark green stalk. Below the stalk is a section of light green which leads to a white bulb. Sometimes the centers are yellow. The whole looks rather like an oversize green onion. Cut off the dark green stalk and remove it to the compost bin or use to season a vegetable stock. What remains is the light green and white and that’s what you eat! Rinse the leek again. Slice lengthwise and discard outer layer. 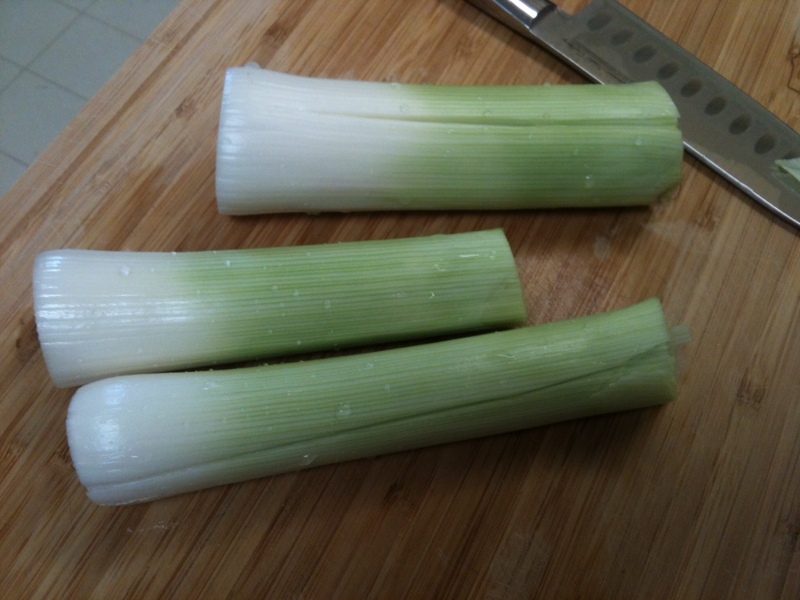 Slice each half-leek lengthwise in the middle. You now have four lengths of leeks. Cut the lengths into half to one inch chunks. 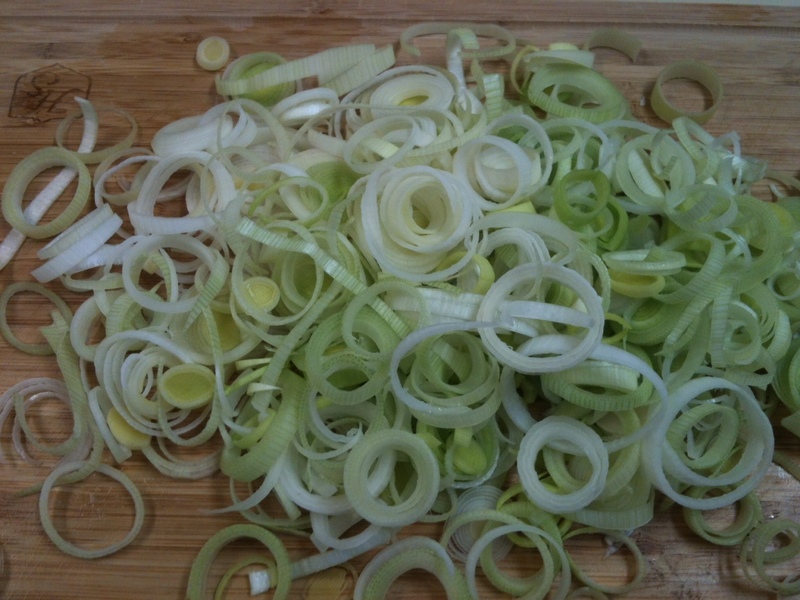 Alternatively, if your leeks are slender, just slice them into little rings. Place the slices in a bowl of cool water and swish about. Drain in a fine mesh colander and repeat until all the dirt is removed. Finally, drain thoroughly and pat with a towel to dry. Measure the butter and reserve to a plate. Mince the garlic cloves and add to small bowl. Measure the thyme, pepper, sugar, and bay leaf and place in a small bowl. Measure the wine. Rinse and chop the parsley. Heat a large sauté pan over medium high heat. Add butter. When the butter melts and starts to bubble, add the leeks. Stir to coat each slice with butter. Sauté for about five minutes, stir every now and then. After three minutes, add the garlic and stir for 1 minute. Sprinkle with thyme, white pepper, sugar, and add the bay leaf. Stir. Add wine (or stock with cider vinegar) and bring to a simmer. Reduce heat to medium low and braise, covered, for 10-12 minutes or until the leeks are tender and the liquid has reduced. You do not want all the liquid to evaporate and lifting the lid causes more evaporation. The leeks should remain quite juicy. Remove the bay leaf. Taste and adjust the seasonings with more pepper and, if you use it, salt. Enjoy this elegant dish mindfully with family and friends. 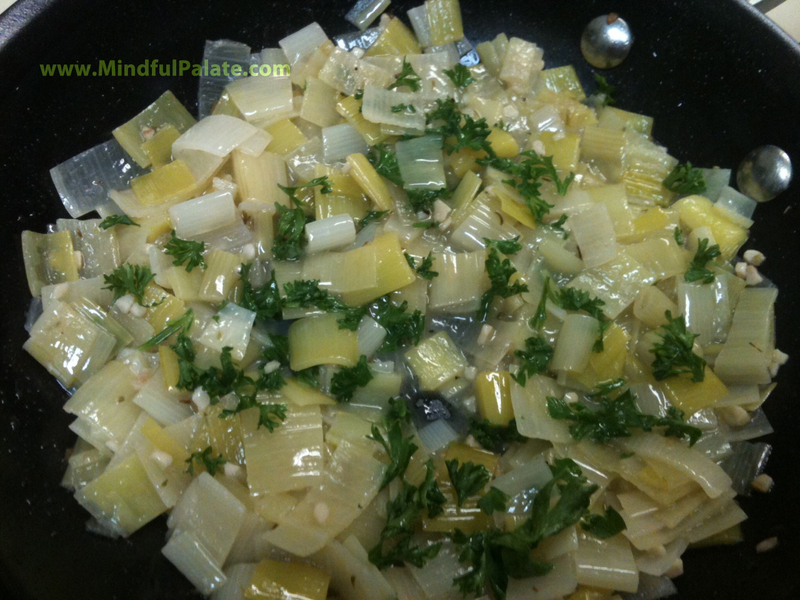 This entry was posted in Side Dish, Vegetable and tagged braised, fragrant, leeks, pinot grigio, Wine. Bookmark the permalink.